View More In Adapters & Multi-Outlets. 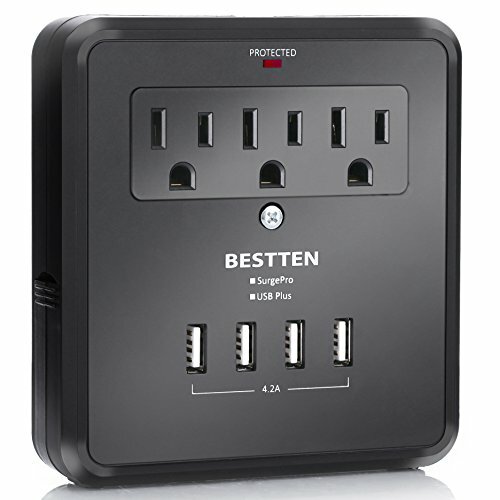 Charge all your essential devices with BESTTEN wall mount surge protector with USB ports. This surge protector lets you safely power and charge up to 3 AC and 4 USB without worry of electrical damage. Wall-mountable design makes it easy to install, keeps floor space clear of clutter, and no more cable chaos. 3 AC outlets allow you to power up to 3 electrical devices, perfect for desktop computers and accessories, phone/fax/modem, kitchen appliances, and standard household electronics. In addition to its 3 AC outlets, this wall charger features 4 protected USB charging ports. This allows you to easily charge tablets, smartphones, and other USB powered devices. With 2.4 amps per USB port and 4.2 amps total charging current when charging 3 or 4 devices, they deliver the power needed for fast, efficient charging. Dual side slide out holders keep smart phones in a convenient place while charging. The side out holders can easily be closed and hidden away when not in use. With fireproof poly-carbonate housing remains at a low temperature reducing fire risk. If you have any questions about this product by BESTTEN, contact us by completing and submitting the form below. If you are looking for a specif part number, please include it with your message.